The new Musclemania® Classic Division joins the Musclemania® World Tour this season. This new division is for men who want to display their complete physique in a classic, symmetry, beach body form. However, unlike Bodybuilding and Physique Divisons, the Classic Division features competitors wearing brief shorts while presenting themselves on stage in individual posing, class line-ups and comparisons. They will be judged based equally upon their Symmetry, Size, Muscle Condition and Presentation. The height classes will be determined after check-in at the show to ensure equal class sizes in the show. There are no limits to competitor weights regardless of height regardless how light or heavy the competitor. * Weight & height classes will be determined at show after check-in. Any natural athlete is welcome to compete in Musclemania events regardless of competitive experience. Beginners, novices or veterans can compete in any regional, national and/or international events. But only Beginners and Novices can compete in designated shows. Veteran competitors may compete regardless of past or current bodybuilding federation affiliations. Professional spray tanning services are available at most shows. Please check show details. Tanning creams are banned at Musclemania and Fitness Universe Shows. Because the Musclemania Championships are natural bodybuilding events, all competitors will be subjected to urinalysis sampling at check-in at the show and Top 5 Finalists’ samples will be tested. 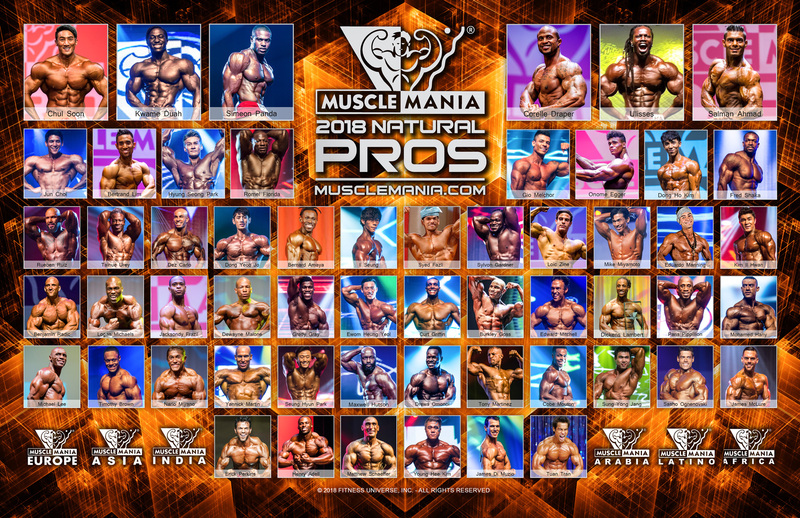 If a contestant tests positive for any listed banned substances, he/she will be disqualified from the competition, forfeit any prizes and/or rewards and be unable to compete in any Musclemania event worldwide for at least 2 years. Also, if a contestant refuses to submit to drug testing or attempts to manipulate and/or alter a urinalysis sample, then he/she will be immediately disqualified from the competition. View the complete list of Tested and Banned Substances. International magazine, newspaper and television media always attend Musclemania® events and contestants are encouraged to take advantage of the national and international publicity. While the promoters cannot promise that every contestant will be selected by the attending media, it is recommended that they bring additional sports apparel, posing trunks and other items appropriate for media photo, video and television sessions. Come compete for promotion and present yourself in a marketable manner throughout the weekend as media representatives select models both on and off the contest stage. For more information, see Media. all forms of Human Growth Hormone are banned.